Please enter your inscription in box when placing your order. The Home Blessing, Hamsa, by artist Mickie Caspi is framed and ready to hang on your wall. Size is 18" x 18". 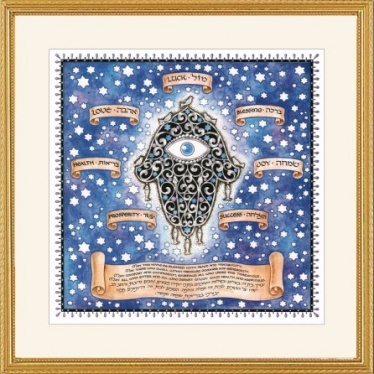 Available with gold frame and Tan Mat The seven blessings (prosperity, success, love, health, blessing, joy and luck) surround the Hamsa, a traditional symbol for fortune & luck. A wonderful gift and excellent home blessing for all. Please select plaque option if you desire personalization. Enter information in text box on order page. I purchased this Hamsa blessing for my home to remind all that live there and enter, that our home is one of happiness and prosperity. It comes ready hang and is of good size. Perfect for my entry way. Colors are vibrant and frame is of excellent quality. Staff was very helpful in choosing just the right blessing for me and made excellent recommendations for other products as well. We received the Hamsa Home Blessing for our new home. We were so happy to receive the Sephardic Jewish motif and the blessings. The size was perfect and easy to hang.